The band has gained immense popularity over time and has become the voice of millions of hearts, establishing a sound ad crazy global fandom for the beautiful and talented maiden members. Courtney Cox, the Iron Maiden’s lead guitarist, in particular, has enthralled the music world with her power and her audacious and explosive shreds, rocking the rock and roll and heavy metal genre through her refined techniques and extremity of pulls. Having set her fingers on her very first guitar at the tender age of 13, Courtney decided to pursue her passion for music. By the time she turned 15, she was accepted at The Paul Green School of Rock Music that polished her natural playing skills through guidance under music maestros. During her time at The Paul Green School of Rock Music, she received extensive practical exposure during her tours and staged acts with established artists such as Adrian Belew, Jon Anderson, Perry Farrell and George Lynch. She co-founded Queen Diamond, a tribute band to King Diamond. Courtney’s natural playing skills refined and improved under the mentorship of the maestro Chris Gordon. After celebrating her 18th birthday in her native town in Philadelphia, Courtney moved over to Los Angeles where she made shared the stage with the Iron Maidens as a guest performer. Having sensed that she was the perfect missing puzzle piece of the band, the Iron Maidens offered her a permanent position as the lead guitarist. Courtney Cox joined hands with the Iron Maidens replacing Heather Baker. The event turned out to be a professional milestone and brought her into the national as well as global limelight. 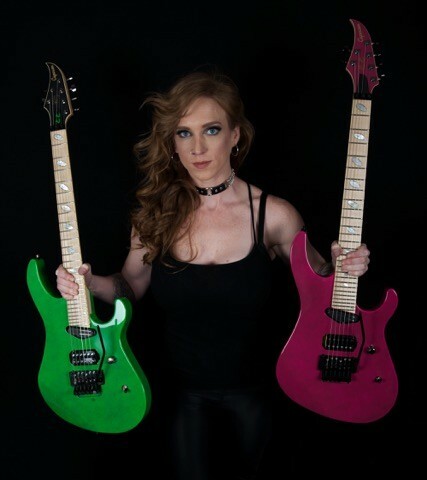 Courtney plays for The Iron Maidens under the pseudonym Adriana Smith, to pay tribute to the Adrian Smith of the original Iron Maiden and has staged many shows and guest appearances in the United States and Japan. Aside from her guitar playing feats for The Iron Maidens, Courtney has successfully attained numerous other highlights on her professional profile. Courtney shared the stage with the Phantom Blue members at the Michelle Meldrum Memorial Concert, held at the famous Whisky a Go Go Nightclub in Hollywood, California. Courtney also made it to the Guitar World Magazine’s Buyer’s Guide Model Search list, where she was successfully bagged the 1st runners-up position. After becoming a part of The Iron Maidens in 2008, Courtney has played on the band’s latest album titled Metal Gathering Tour Live in Japan, which was released back in 2010. Make no mistake about it; this young lady can shred. Courtney and her fellow guitarist, Nikki Stringfield, are the modern-day Glenn Tipton and K.K. Downing. Talented, precision, and dedicated to their craft. We recently had a quizzy and interactive session with the young, lively and super-talented Courtney Cox about her new Caparison Signature Guitar. Here’s what she shared about her career hallmarks and future aspirations. I know they’re releasing the Horus-M3 CC guitar for you. What are the specs of your guitar? CC: I’ve put my time in during my career so far, played numerous guitars from different manufacturers and after finding a company that was right for me and the ability to work with their master luthier personally. I have THE guitar that is perfect for me. Specs you ask?… HERE YA GO! What drew you to Caparison Guitars vers the competition? CC: I’ve been a King Diamond fan for god knows how long, haha… I first heard of the company through old photos of Andy Laroque when he used to play their Horus model, and it was the Iris Violet finish that caught my eye years ago when I was a kid. As everyone knows, I’ve been with other companies and have played numerous eye-catching guitars, but it wasn’t until I had a Caparison in my hand that it changed the whole playing field for me. As a player to another player, you need to try one if you haven’t. Do you have a preference for a specific wood you’d like your guitar to be made of? The CCSHRED solo album, will we see it this year? CC: My solo stuff is a step forward into the unknown. I’ve given away pretty much every aspect of my personal life or any life for that matter to what I do. Whether it be on the road, on the stage, and to social media. When you give that much away after so many years, the only thing you have left to yourself is what goes on in your mind. I’ve been reluctant to release the stuff I have written for this reason. It may seem strange to others, but when that’s all you have left, you are incredibly protective of it. After going through the ups and downs of life and the things that I have seen, I’m ready to tell that story. For what is a song if it doesn’t have a story? Tracks will be released as they come to life and when I feel that they are ready. It’s not exactly putting pen to paper so much as when is a song ever really finished? What endorsements do you have away from The Maidens? I remember you have a different string company that you use. CC: The majority of my musical endorsements are of my own as I’ve been touring since the age of fifteen and have been working with other bands throughout my career with the Maidens, with the exception of BBE pedals (I swear by their Boosta Grande haha). For my strings yes! I recently got on board with DR strings, which was the brand of strings I used to use religiously when I started playing, because of Dimebag. Funny now that I’m on the artist roster! Full circle! I use their Veritas strings, which save me on the road because I can get through at least three shows out of one set without a string breaking.. unheard of for me haha.